The volunteers of the D-Day Squadron will make an epic journey across the ocean with a fleet of American C-47s, each vintage aircraft meticulously restored to flying condition. The Squadron will join up with C-47s from Europe and Australia for Daks Over Normandy, a flyover of more than 30 aircraft to drop 250 paratroopers over the shores of Normandy on June 6, 2019, commemorating the 75th anniversary of D-Day. The skies will be filled once again with the sight of freedom, and the citizen soldiers and aircraft that helped bring about an end to World War II will be honored in this historic tribute. This entire fleet of warbird aircraft will be on static display at public events in both the United Kingdom and France for the education and enjoyment of people of all ages. As time marches forward, fewer D-Day veterans remain with us. The D-Day Squadron believes in the importance of remembrance and education to ensure the memory of these brave soldiers – and the significance of World War II – is fully appreciated for generations to come. Donor support is crucial to this effort. 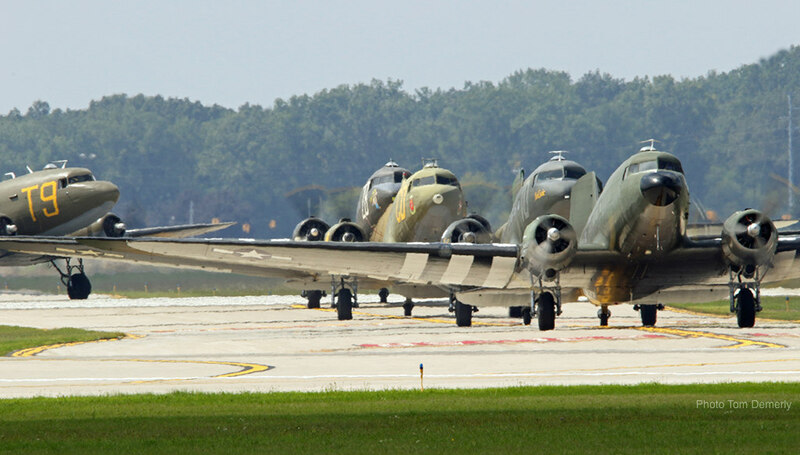 Funds raised will be used for the safe passage of the American C-47 fleet to France. Pledge your support HERE.